A Corentyne carpenter was pronounced dead on arrival at the Skeldon Public Hospital yesterday morning after he was involved in an accident, sometime between 8 am and 9 am, on the Number 47 Village Public Road. 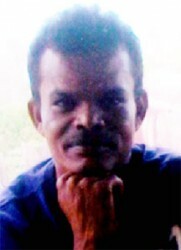 Dead is Gopaul Megnauth called ‘Paulie’, 39, of Number 47 Village, Corentyne, Berbice. sometime around 7.30 am to go to work at a nearby rice mill. 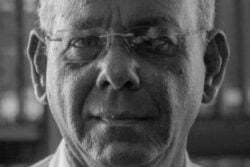 Police in a press release reported that Megnauth “was travelling in the tray of a motor lorry along the Number 47 Public Road, when he fell off the vehicle”. Megnauth reportedly fell onto a parked truck and sustained a severe head injury. His family described the injury as a “big hole” on his head. The driver of the motor lorry is in police custody at the Number 51 Police Station assisting with investigations. Yesterday afternoon, when Stabroek News visited Megnauth’s home, preparations were being made for a wake. His sister Devika Nohar said that the family received a telephone call around 9 am informing that Megnauth had been in an accident. Dinesh Megnauth, a brother, explained that lawmen and residents of the area told him that his brother had been sent to load rice manure from Nand Persaud Rice Milling Complex at Number 36 Village, Corentyne. It was while he was returning from the milling complex, he was told, that his brother met his demise. After he fell out of the truck, Megnauth was reportedly rushed to the hospital where he was pronounced DOA. According to the brother, he was told that his brother was still alive when he was picked up, but died on the way to the health institution. Family members are calling on the employers to stand the expense of the funeral. They are also asking that the employers come forward and state the truth of what happened. Megnauth was a carpenter who worked along with his brother Dinesh. Dinesh said that because of the inclement weather work had stalled and this must have been why Megnauth went to work at the rice mill. He had only been working there for a few days. Megnauth leaves to mourn his wife and three children, including a four-month-old baby he had adopted and his seven siblings.